So I played a lot of Blood Bowl this weekend, but didn't do crap for 40k. I'm not really complaining. It has been a few solid week/weekends of work. I spent nearly 6 weeks getting my Templar done up for 'Ard boyz. Then I turned around and did some work on the Tau. A little break is not a bad thing. We are having another get together this Friday for 1850 again. 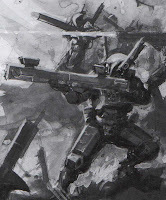 I'm debating whether I bring the Tau out again and work on refining the list, or do I bring out my orks. Here's the refinements to the Tau list. It is slightly different than the modified list I put up last week. The list last week is probably better, but I don't have the hound models and I do have the FWs. It probably isn't quite as 'tight' but is probably still ok if I don't try to hope to get much out of a single static troop choice. It would be nice to see if I can keep a win streak going with these guys or, if nothing else, find where they break down. I'd need to get two more pathfinders put together. I probably still wont paint the hounds until I eventually pick up another 6 and then paint them all together. On the other hand I could always run my orks. My 1850 ork list is tweaked pretty well and I've played it enough to know the ins and outs. They haven't played since new gaurd had been out, and I think IG could make a nasty ork killing list. However I'm not sure the 'normal' IG mech lists out there are tuned up for an ork army of this nature. I haven't run them since Kublacon in May, but the list is pretty much 6-0 in tournaments (one overall win, and 2nd overall at Kublacon), and i think 10-1-2 in practice games. There isn't a lot of dead weight in the list: it is only 12 kp as opposed to the Tau list above 17 kp. The kannons and buggies are the real soft spots and they are a solid bit of my anti armor. However most of the time people are (rightfully) freaking out about all the boys, Ghaz, lootas, and Snikrot so they can sometimes slide under the radar. I may want to break out this list just to see/remember how it works. Or I could get crazy and mix it up with some different unpainted units like grots and stormboys just to give them a try. You still never call me for Blood Bowl. I cry now. Cry.